The Hon. Vance Amory and the Hon. Ian Patches Liburd. 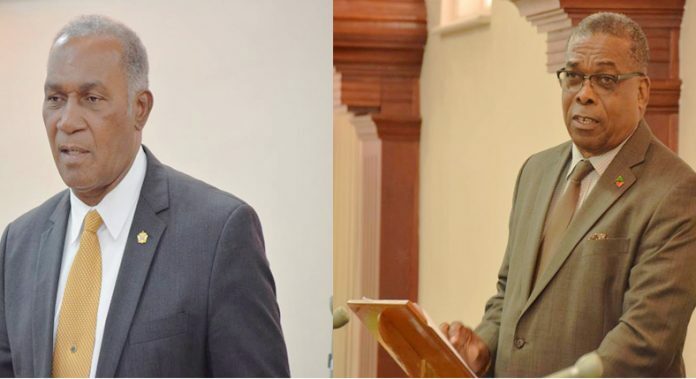 BASSETERRE, St. Kitts — Senior Minister and Member for Nevis 10, the Honourable Vance Amory, and the Honourable Ian Patches Liburd, Member for Constituency 1, were both nominated by Prime Minister Dr. the Honourable Timothy Harris to serve as members on the Constituency Boundaries Commission. Prime Minister Dr. Harris made the announcement today during his press conference at the Parliamentary Lounge, Government Headquarters. The Constituency Boundaries Commission is a constitutional body appointed in accordance with the Constitution of St. Kitts and Nevis. The Constitution provides at section 50 for the review of constituency boundaries. Section 50 (1) gives the Commission the authority to review the number and boundaries of the constituencies into which St. Christopher and Nevis is divided and submit its reports to the Governor-General. According to section 50(2) of the Constitution, reports are to be submitted by the Commission at intervals of not less than two, nor more than five years. “The last report was submitted on January 16, 2015, by the then outgoing regime. We are therefore well within the two to five year interval,” Prime Minister Harris said. Prime Minister Harris said it is his hope that the Constituency Boundaries Commission will soon commence its work.